/UCW/ ATLANTIC CITY, NJ and BROOKLYN, NY – It was announced today that World Wrestling Entertainment Superstar and former Olympian Mark Henry is slated to attend the largest martial arts event of its kind in the world, The Action Martial Arts Mega Weekend at the Tropicana Casino in Atlantic City, NJ. He will be part of the weekend long festivities, speaking with fans, signing autographed pictures and he will be along side other martial arts legends and leaders. This will take place from January 27-29, 2017. “We have been looking forward to having Mark Henry at the Tropicana for the Mega Martial Arts Weekend, so I was pleased to speak with him and get the good news. He is a class act and a definite role model for the youth, we welcome him to our family with open arms. We look forward to making additional announcements as we lead up to the once a year event in Atlantic City, NJ”, Stated Action Martial Arts Mega Weekend founder Alan Goldberg. 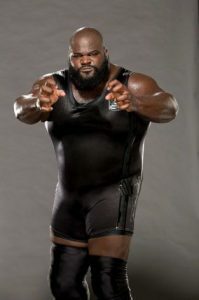 Mark Henry is an American powerlifter, Olympic weightlifter, strongman, and professional wrestler who is currently signed to WWE on the Raw brand. He was a two-time Olympian in 1992 and 1996 and a gold, silver, and bronze medalist at the Pan American Games in 1995. As a powerlifter, he was WDFPF World Champion (1995) and a two-time U.S. National Champion (1995 and 1997) as well as an all-time raw world record holder in the squat and deadlift. Currently, he still holds the WDFPF world records in the squat, deadlift and total and the USAPL American record in the deadlift since 1995. He is credited for the biggest raw squat and raw powerlifting total ever performed by a drug tested athlete, regardless of weight class, as well as the greatest raw deadlift by an American citizen. In weightlifting, Henry was a three-time U.S. National Weightlifting Champion (1993, 1994, 1996), an American Open winner (1992), a two-time U.S. Olympic Festival Champion (1993 and 1994) and a NACAC champion (1996). He holds all three Senior US American weightlifting records of 1993–1997. In 2002 he won the first annual Arnold Strongman Classic. Since joining the World Wrestling Federation (now WWE) in 1996, he has become a one-time WWF European Champion and a two-time world champion, having held the ECW Championship in 2008, and WWE’s World Heavyweight Championship in 2011. The Ultimate Destination is the world’s largest gathering of martial arts superstars, film and combat celebrities Wrestlers , Sport stars and renowned Masters from around the world. The Ultimate Destination is the only destination where you can congregate, meet, greet and share with thousands of fellow martial artists who gather together from around the globe. and the world’s largest assembly of celebrities, champions, suppliers and, of course movers and shakers in the martial arts & MMA industry Thousands of people attend The Ultimate Destination each year. Something for the Novice to the expert or even just a fan .There are 3 days of amazing seminars (50+) taught by THE BEST OF THE BEST and all seminars are free and new this year we have included a stage for 12 amazing shows throughout the weekend. Open to the public and to dinner guests. Now with the Health and Fitness Industry In our show it has open even more doors, not being any surprise due the crossover markets our. In 2017 we have extended the Trade show to accommodate this new and growing part of our ever expanding event. In 2015 with the MMA and Martial Arts, and fitness Industry we were honored with the distinction of becoming one of the largest convention ever held in the Tropicana Casino Convention Hall. The only destination is The Ultimate Destination for Martial Arts taking place on January 27-29, 2017 at The Tropicana Casino & Resort Atlantic City. For more information contact Alan Goldberg at Actionma4@gmail.com or call him at 718-856-8070. You can also visit the website www.ActionMagstore.com for event information and registration forms for The Ultimate destination.